Newly renovated 5 BR 4 BA pool house with hot tub and pond on 5 acres! Property Size 4,000 sq. ft.
Babe's Pond is a newly renovated 5 bedroom 4 bath home that sits on picturesque 5 acres. The residence boasts over 4000 square feet of living space. The open space Great Room has 5 skylights and 20 windows. It includes a fully equipped kitchen, dining table, fireplace, and multiple seating areas for gatherings and relaxing. The lower level living area is perfect as a man/teen cave with its own living area equipped with fireplace, wet bar, and a bedroom with two queen beds and en suite bathroom. 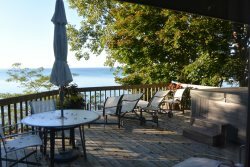 Families, couples, or friends can enjoy strolling around the scenic grounds, sitting outside on the expansive deck and outdoor porch, dipping in the heated pool, feeding fish in the pond, an evening in front of the fire pit, soaking in the hot tub, or finding an inviting spot for reading a good book. Charcoal grills allow for a great barbecue experience! The house is within walking distance from the Round Barn Winery and minutes away from the beach, restaurants, boutiques, farmer's markets, antique stores,and the local casinos. Our number one goal is to do everything possible to ensure that our guests have a fabulous stay at Babe's Pond! Fire Pit - great new one just built! Jon was accommodating, responsive to questions /concerns,friendly & courteous. Toni made sure we had a grill & was helpful with food recommendations not to mention friendly. Phenomenal. Beautiful home & property. Outdoor space. We had the opportunity to share time & space yet be able to have separate conversations, music, pool etc the outdoor porch was amazing for a nightcap. The entire house was amazing.